Community members came together to protest energy and food poverty. North Hastings Community Trust and the Put Food in the Budget campaign rallied with community members to end poverty in rural Ontario Saturday Sept. 24. 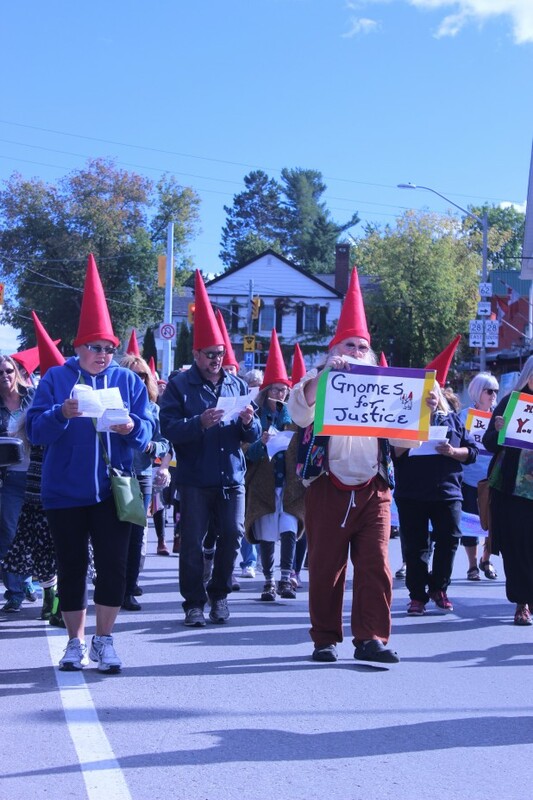 In a sea of pointed red hats — marking them as gnomes against social injustice who can’t stand around any longer — almost 50 people marched down Hastings Street North. The mission was to stop hydro disconnects, recognize poverty in the area, and alert the powers that be that North Hastings has had enough. The protest was the culmination of three public consultations held across North Hastings. People came together in Bancroft, Coe Hill and Maynooth to share their stories and experiences with poverty. One woman from the consultations spoke to her experiences at the rally. She remembered a man she visited. “I asked him what he was doing for food, he said that because a partridge hit the window, and a buddy brought him a bag of deer meat, that was how he got through the winter,” she said. 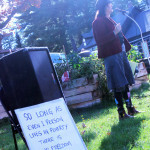 North Hastings Community Trust (NHCT) program co-ordinator Jane Kali called for an end to all hydro disconnects. She said the government systems that provided for the impoverished don’t work. Poverty Roundtable Hastings Prince Edward director Christine Durant was among those who assembled. She commended the NHCT for its work and suggested that together they would work to create a centralized voice for change. 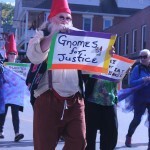 The idea for gnomes against social injustice was explained at the rally. The Put Food in the Budget compaign’s mascots were tired of standing around in their gardens and doing nothing to ensure financial security and justice for all. North Hastings Community Trust energizes protest attendees calling for an end to poverty and an end to hydro disconnects. 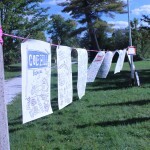 Banners from each consultation, held in Maynooth, Coe Hill and Bancroft, were hung at Riverside Park to give a voice to those who couldn’t attend the rally. Members signed with comments against privatization and poverty, and with support for the rally.